A neuroma is thickening of the tissue surrounding a nerve that travels between the base of two toes. It is caused by repeated mild injury to the space between two toes, which can occur when footwear does not fit properly or in people that run frequently. The thickened tissue then causes pain in this area, especially felt when walking. A neuroma is first diagnosed based on the history of the type of pain someone is having. There are also ways to examine the foot that can diagnose this condition. In some cases an MRI is done to obtain pictures of the tissue in the foot. The simplest form of treatment involves wearing shoes that allow the feet plenty of room on the sides. In some cases an injection can be given into the neuroma. In difficult cases surgery can be curative. 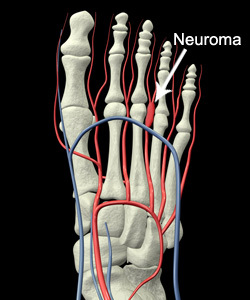 The pain caused by a neuroma can progress and become severe.